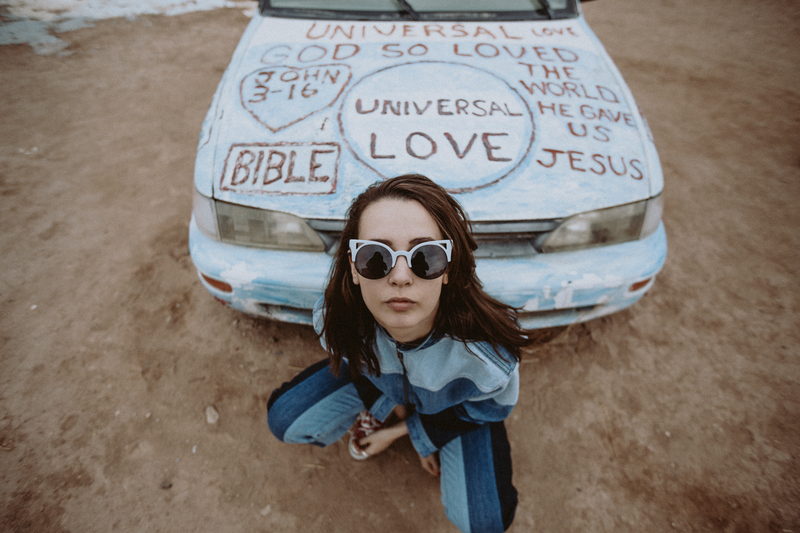 A cat scratching in her throat, full of banter and insolent, tearing cracks through nature: Natalie Findlay comes from the same bloodline as PJ Harvey or The Kills’ Alison Mosshart. Today Findlay runs and jumps across genres. She revisits 90s grunge, flies up into the skies of shoegaze and creates lightning with hip-hop, before landing in a dream world of garage pop. She loves Motown artists, psychedelic rock, blues and well as hip-hop, she creates electronic soundscapes drawing from all styles to mix and create textures filled with aspiration. She composes alone, mostly on guitar, sometimes on piano, or turns her voice and words into drum rhythms to serve as a canvas, always on the lookout for strange sounds and new distortions, carried by her addictive choruses. Her list of conquests is long: The Isle Of White Festival, Sound City in London, a sold out show at Gorilla in Manchester, as well as support for Jake Bugg, Miles Kane and Brandon Flowers. In France she impressed at the Inrocks, Chorus, Europavox, Cabaret Vert and Garock Festivals, her explosive performances burning into the memories of all who attended. Early 2015 saw the release of a digital EP “Electric Bones” on BMG, which rapidly impressed the media, embodying a new era of new-wave punk-rock from the West. She doesn’t give much of her secret away, except when it comes to poetry, heavily influenced by David Lynch’s weirdness and Michel Gondry’s “Eternal Sunshine of the Spotless Mind”, both engraved into her mind as total works of art. She often dreams of writing film music, and equally curious about fashion and testing the waters of new artistic worlds. With her first album so full of energy and powerful juvenile emotions, Findlay has got it just right, telling her tale full of emergency without filtering or watering down a thing. She describes the madness of the city of London, the broken souls, chaotic moods, the ferocious appetite for life, addiction to love, the failures and doubts lurking everywhere. “Forgotten Pleasures” is her inner world represented by 13 songs that fit together despite their stark contrast. The sparse melancholic piano in “Sunday Morning In The Afternoon” rubs against the rough textures of “Electric Bones”, then we take a trip to the 80s with the intoxicating “Waste My Time”, illuminating the night sky with synth flashes of purple and white, before moving on to the more introspective “Monomania”, a kind of pagan prayer with its roots from minimal blues. With “On & Off” (used by BMW in their recent international campaign) the young musician clashes a sensual and cinematic 50s rock vibe with a torrent of garage rock. Both nonchalant and vulnerable, Findlay goes more riot grrrl than ever on “Junk Food”, which contrasts with the deep, almost siren-like “Forgotten Pleasures”. On the title track she remembers her darkest days and heals the wounds of the past, the ones that helped her rebuild into a stronger self. The album jitters with her indie rock influences - Beck, Tame Impala, The Velvet Underground – but she seizes the listener with her own firm grasp on music mythology and makes it her own. On her debut album, Findlay is accompanied by Jules Apollinaire (also a co-producer) on keyboards, bass and guitar, Ben Simon on guitar, and Christina Lamas on drums. She knows how to pick her entourage well, collaborating with Carl Barat of the Libertines to compose “St. Elmo’s Fire”, and bringing in producers Jake Gosling (The Libertines, Ed Sheeran), Samy Osta (Woman, Fire Chatterton, Rover!) and Flood (Nick Cave, Depeche Mode, Smashing Pumpkins, well, just about everyone). Their mixes help reveal Findlay’s complex personality, shedding light onto its contrasting landscapes, bringing harmony and disorder together in a beautiful chaos. The result is an album that blends the male-dominated rock sound of yesteryear with a the indomitable spirit of a girl who isn’t to be reckoned with.